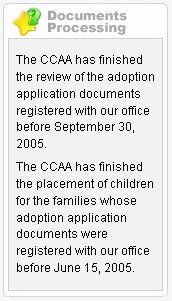 Our Adoption Journey: Could it be????????? The website has changed!!!!!!!! Does this mean we have been matched?? Our documents were registered (logged in) on June 13, 2005. I am trying not to get too excited seeing referrals don't always seem to match what the CCAA website states. The families that got their referrals the beginning of May should have received their the beginning of April according to the website ........ but then other groups in the past got them right on time. I am besides myself. I am so excited but trying to be realistic. The CCAA should be starting to mail out referrals at the end of the week. This may mean we will learn about Sophia at the beginning of June. I can't even think straight right now. Please pray that we will get our referral soon. I am Steve's mother and my husband Skip and I are so thrilled for him and Anne that this long awaited miracle seems to finally be about to happen. We understand how difficult the long wait and "going through the hoops" of the adoption proccess has been for them, and we are proud of their patience and perseverence. But of course those are just some of the reasons Sophie is going to have such great parents! Can't wait to see her beautiful face! Here's hoping the stork flies quickly!!!!! !